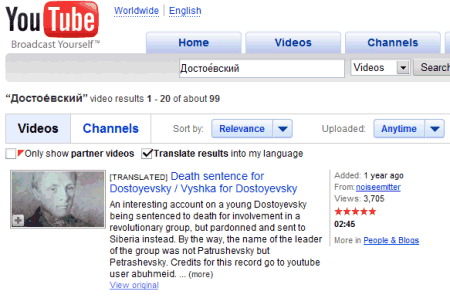 YouTube tests a new option that translates the search results into your language using Google Translate. Now that you can independently select the interface language, it would be nice if the user-generated content was available in the same language. The translation API offered by Google can be easily integrated in web applications, especially that it can now preserve HTML markup. I expect to see a lot of applications that take advantage of the API, from webmail services like Gmail to browsers and IM clients. 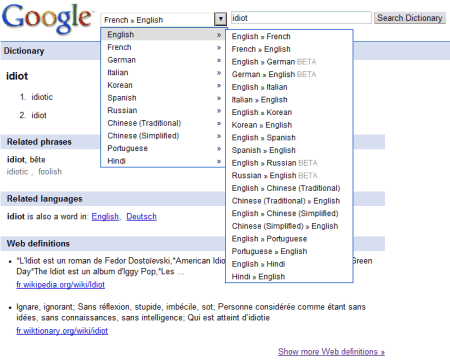 In other machine translation news, Google Dictionary has a new interface and it now supports more language pairs. There's also a section for definitions found on the web. How do I switch this *censored* thing of? It translates the name Kapa into capacity. Can I mark words as do-not-translate somehow? My BF has uploaded a vid and is now bugging me why it says he is talking about capacity and what _I_ will do to correct it. 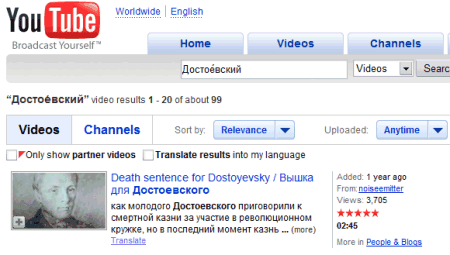 How come this damn word "Вышка" become translated to "Vyshka"? What the hell?